Individual training: This training is designed for more experienced goalkeepers. Training sessions are usually 60-75 minutes long and focus on a specific skill set each session. 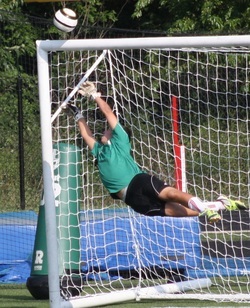 Goalkeepers can expect a rigorous workout with instant feedback on all parts of the session. Individual training is $70 a session. Small group training: This training is designed for goalkeepers of similar abilities who would like to train together. Small group training sessions run for between 65-80 minutes and focus on multiple topics each session. Goalkeepers have the opportunity to get specific feedback as well as watch other keepers train. Small group training is $35/ player. Team training: This training is designed to work with goalkeepers on multiple topics as well as incorporate the goalkeeper into the team training. In addition to shot-stopping, the sessions focus on communication with the rest of the team and positioning on set pieces. Team training is $75 session for two keepers and then the small group training rates apply. Club Training: This training is designed for all the goalkeepers in a club. In each session all the goalkeepers from a club will train together on a specific skill set. Goalkeepers will be broken down by age and ability within the session. Cost of the training is based on the size of the club and the number of keepers attending.